The first football match has taken place in Aleppo since 2012 when the Syrian city became the battleground between rebels and pro-government forces. Local side Al Ittihad Aleppo hosted Al-Horriya in their first game on home turf since the Syrian Army regained control of the whole city. 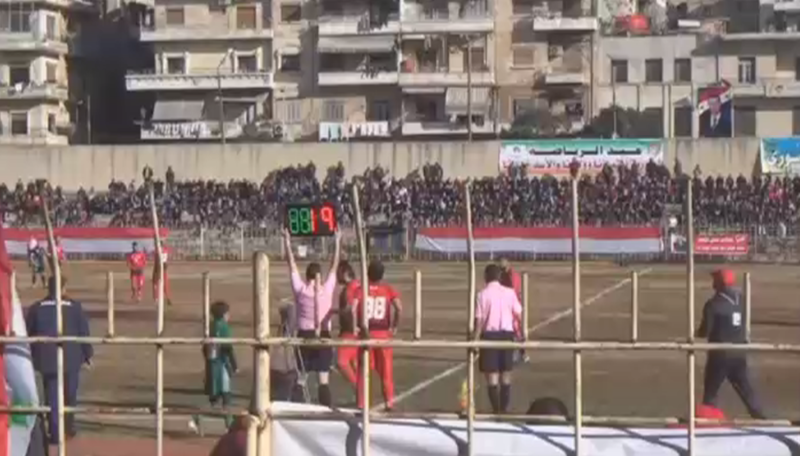 Fans packed the stadium and waved Syrian flags to mark the first sporting event in the city since the beginning of the so-called Battle for Aleppo. More than 30,000 people were killed during the battle for control of what was once Syria’s biggest city, amid the country’s ongoing civil war. The battle ended in December when rebel forces withdrew from most of their remaining territory in the east and government troops moved in. It took Ittihad just one minute to score the first goal of the game through Raafat Mohtadi. Horriya leveled with a goal from Firas Al Ahmad on 37 minutes but, with the game seemingly heading for a draw, Rabea Sror netted the winning goal in the 96th minute to give the home side a 2-1 victory. “It is an indescribable, unnatural feeling to return to the pitch, in the stadium in Aleppo after five years. Today we come back to the stadium, the people are out,” he told Ruptly video agency. “It has been five years and we have been longing for anything to happen in Aleppo. Now, football matches are taking place again. There is an atmosphere of safety and security in Aleppo,” said one member of the crowd. “The last match I saw here was in 2010. It was bigger and there were more people,” another fan said.